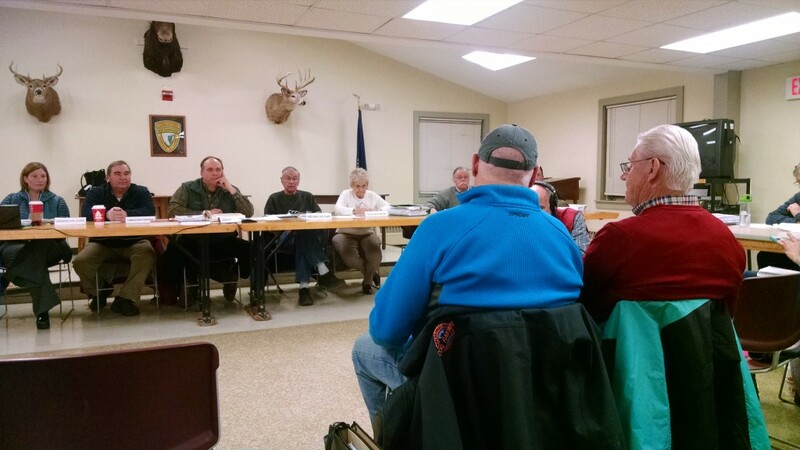 It was a snowy December evening and the Coos County Planning Board meeting was packed. There were over 40 members of the outdoor community in attendance to hear what Wayne Presby, owner of the Mount Washington Railway Company (MWRC), had to say about his latest plans to introduce more development on the tallest and most iconic mountain in the Northeast. The MWRC owns a 99-foot wide tract of land on which it operates the Cog Railway, a mountain train that has been taking passengers to the summit since 1869. It is at 5,600 feet on this tract of land, perched above the cliffs of the Great Gulf Headwall, where Presby intends to build a 25,000 square foot, 35-room ‘luxury’ lodge. That same evening, a small group of North Conway based climbers began preparations to organize opposition against, what Presby called, Skyline Lodge, with the intention of halting the formal building application to the Planning Board. 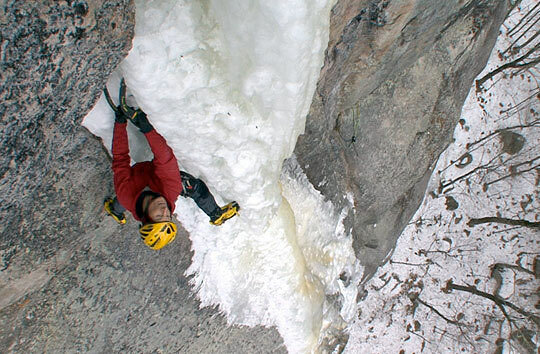 Soon after, the group formed Keep The Whites Wild (KtWW), a New Hampshire non-profit organization. Their mission: to preserve and protect the diverse biology, natural aesthetic, and intrinsic value of New England’s White Mountain region. They quickly launched Protect Mount Washington, a campaign specifically designed to stop MWRC’s lodge proposal. When the news broke, it made both regional and national headlines. The Washington Post read: “Coming Soon: a Luxury Hotel With the Worst Weather You’ve Ever Seen”, while the Boston Globe and New Hampshire newspapers published articles interviewing those for and against the development. As time went on and word spread, the opposition grew. Two months after the announcement, six conservation groups, including the Nature Conservancy and Appalachian Mountain Club, submitted a letter to the Coos County Planning Board stating the development would be harmful to the sensitive alpine habitat and is contradictory to County Master Plan which was adopted to conserve and protect these natural and ecological resources. The Protect Mount Washington campaign started an online petition just days after the announcement and it has now received over 17,000 signatures. Since that time, Protect Mount Washington has been on the front lines defending the alpine tundra which is in danger of being irreparably harmed by the Skyline Lodge proposal. 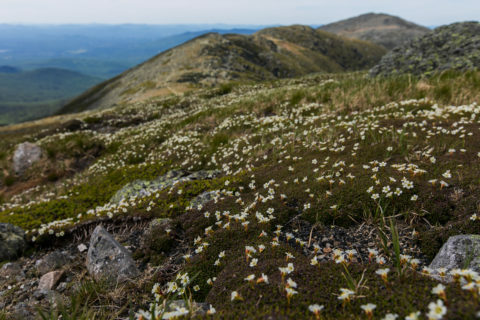 Backed by scientific expertise, they contend that the rare alpine habitat, which comprises less than 1% of New Hampshire’s landscape yet holds numerous rare and some endemic plant and insect species, is too ecologically important to lose. Using that reason and others related to safety and view-shed impacts, they have undertaken public advocacy by fielding thousands of emails and phone calls, sending out press releases, organizing events and networking with numerous conservation organizations and countless individuals. Perhaps the biggest move the campaign has made was hiring an environmental attorney, Jason Reimers of BCM Environmental Land Law to defend the recreational, ecological and economic benefits that Mount Washington provides to the region. The MWRC has also been busy since their announcement. 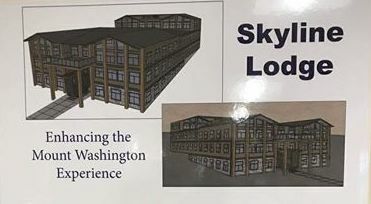 Wayne Presby continues to inform the public that Skyline Lodge is still on the table despite having not formally applied for permitting through Coos County; and there is no evidence to the contrary, as surveyors were recently seen in the proposed building area. In a recent move which could be interpreted as a step toward the reality of the lodge, the MWRC sent excavators from the railroad base station up along their tracks and began moving soil. Without any local or state permitting, they cleared and widened an old utility trench scar that serves the summit buildings with the stated intention of driving passenger-carrying snowcat machines up and down the mountain. Although they own the land, it is zoned as a Protected District (PD6), and only certain activities on that land can happen without permitting. According to the Coos County Zoning Ordinances, the purpose of PD6 is to regulate certain land use activities in mountain areas “in order to preserve the natural equilibrium of vegetation, geology, slope, soil and climate in order to reduce danger to public health and safety posed by unstable mountain areas, to protect water quality and to preserve mountain areas for their scenic values and recreational opportunities.” Lands are zoned as such in areas above 2,700 feet in elevation or slopes in excess of 60 percent (27 degree angle) over ten contiguous acres. Diapensia, listed as a NH rare and threatened plant, growing in the alpine zone. Keep the Whites Wild argues the use of the land as a road intended to bring tourists to the summit of the mountain would be prohibited according to County regulations and they’ve requested the County Commissioner cite MWRC and require it to restore the land that was disturbed by the excavator work. Presby responded to reporters stating he is well within his rights and told InDepthNH.org that he built a trail, not a road and didn’t need a permit. Debris and coal along the Cog tracks. 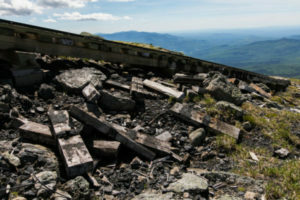 According to InDepthNH.org, he said Keep the Whites Wild misunderstands the zoning regulation and his plan for the three-mile trail is for maintenance and to provide emergency responders and others quicker wintertime access to the summit than the auto road, which is eight miles long. However, the Berlin Daily Sun reported that during a Mount Washington Commission Meeting in November, Presby stated the Cog had just opened up a trail to the summit that he believes will be able to accommodate passenger-carrying snowcats up the three-mile route in winter, a concept that would soon be tested. At the upcoming Coos County Commissioners meeting on December 13, 2017, commissioners plan to discuss KtWW’s letter and potential violations brought up by the Protect Mount Washington Campaign. When the MWRC is going to formally apply for the permits to move forward with the Skyline Lodge is a question still unanswered. In the meantime, the alpine of Mount Washington puts on its coat of white as winter settles in. 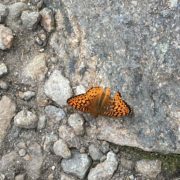 The large majority of hikers and tourists leave the high peaks as the plants and insects continue to find a way to survive in the harsh extreme. Ice climbers, backcountry skiers and hardy winter hikers will start coming to the mountain now to watch the landscape transform into a cold, strikingly beautiful world. To all who seek out the mountain’s ravines, trails, rocky cliffs, icy gullies, alpine gardens, famous weather and tallest summit, Mount Washington is a precious and finite resource. It is a resource that provides not just significant ecological value, but also solitude, challenge, appreciation, reflection and inspiration. When I heard about the Cog Railway’s intention to build a 35 room upscale hotel and restaurant along their tracks on Mount Washington, I almost didn’t believe it. I felt frustrated and angry over the fact that there are people with the ability to tamper with something I love. For many of us, Mount Washington is our place to experience nature’s force, and to challenge and humble ourselves in a wild and frequently harsh and unforgiving environment. My time on Mount Washington’s slopes has made a significant impact on shaping the person and climber I am today. Although I am fully aware of the what occurs just above me on the summit, I remain on the ice and rocks of the ravines below and see a mountain too special and unique to be the victim of selfish interests. As chronicled in Mount Washington’s long history, it’s apparent the mountain has meant something entirely different to others. Building and development is nothing new in the White Mountains, especially on New England’s highest peak. As early as the mid-19th century, the mountain was developed into what can be considered one of the first tourist destinations in the country. Numerous bridle paths, most notably the Crawford Path completed in 1819, were constructed to the summit. In 1861, when the five-year road project was complete, the mountain suddenly became accessible for all. Waiting on top for the growing number of visitors were hotels and restaurants beginning in the 1850’s all the way until 1980, when the last hotel was demolished for the construction of current Sherman Adams Visitor Center. Despite devastating fires the 1900’s, developers continued to build and re-build hotels and restaurants to attract more visitors each year. Battles over ownership of the peak frequented the New Hampshire court system, a telling sign of the mindset of that era. It didn’t take long after European settlers first saw the mountain for it to become the center of exploitation. After the road was open to the public, its business doubled every year until 1869, when the most impactful event happened. The Cog Railway was complete. It was a turning point for life on the summit of Mount Washington. “Never again by the new rail can he have the sensation that he enjoyed in the ascent of Mount Washington by the old bridle path from Crawford’s, when, climbing out of the woods and advancing upon that marvelous backbone of rock, the whole world opened upon his awed vision, and the pyramid of the summit stood up in majesty against the sky. Nothing, indeed, is valuable that is easily obtained.” -Charles Dudley Warner, 1886. Now, 130 years later, this same entity is trying to repeat history, but I believe at a higher cost as the sensitive alpine environment is continually under the threats of our current age. I don’t deny or ignore the history of Mount Washington when I plead my case to stop further development on the mountain. It would be impossible. It is that history preventing efforts to conserve what remains of not just Mount Washington but all areas of the White Mountains under constant risk of human intrusion. The precedence has already been set, as pointed out by the owners of the Cog Railway, and used as an argument to support the hotel’s construction. Just last year, the Appalachian Mountain Club (AMC), who owns and maintains the existing and historic hut system along the Appalachian Trail, announced their intent to construct a new hut in the already overcrowded area of Crawford Notch. Thankfully, days after the Cog Hotel news broke, the AMC officially terminated their plans, noting the opposition they were receiving. Maybe it’s time to change history for a better future for our mountain ecosystem we cherish. Let’s allow our future generations to enjoy an untarnished landscape and teach them care and conservation through our present actions. Thank you to my fellow hikers and climbers who feel similarly to myself and are actively fighting the construction of this hotel. 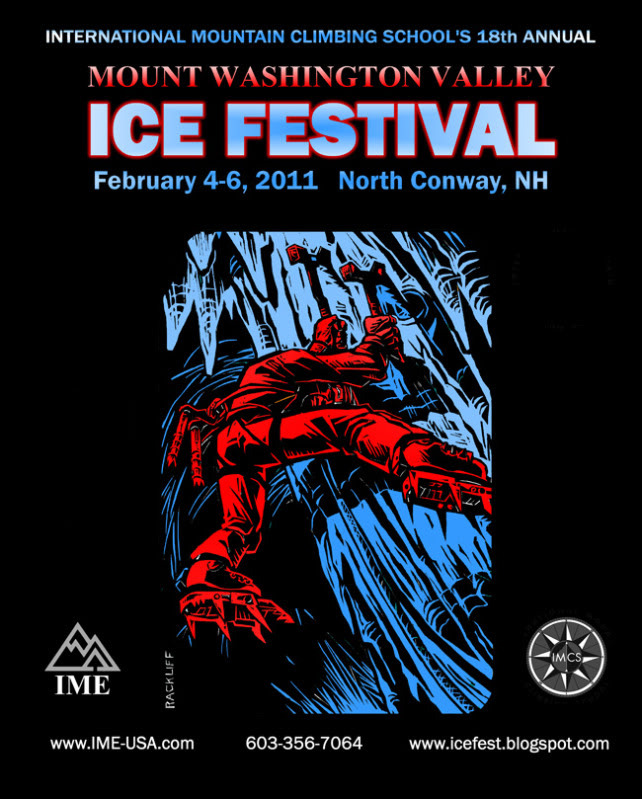 The following information has been pulled together by the help of this community who love the White Mountains. Mount Washington State Park is a 60.3-acre (24.4 ha) parcel perched on the summit of Mount Washington, the highest peak in the northeastern United States. Summer seasonal amenities include a cafeteria, restrooms, gift shops, the Mount Washington Observatory and its museum. In April of 1894, the Mount Washington Summit Road Company, owners of the summit at the time, sold a 49 acre circular tract to the Mt. Washington Railway Company. That land constitutes the bulk of today’s Mount Washington State Park. A small segment of the summit is still owned by the Cog Railway and used as the upper terminus of the railway. A Planning Board meeting was held on December 8th where owners of the Cog Railway discussed their general plans for the hotel. The purpose of the meeting was a preliminary discussion with no consensus or decision making at this early stage. No formal application was submitted and it was not open to official public comment, however, over 40 members of the hiking and climbing community attended the meeting. The Coos County Planning Board held a meeting tonight (12-8-16) in Lancaster, NH where we listened to a preliminary review of a (conceptual) proposal of a 35 room hotel and restaurant at about 5,200′ of elevation in the alpine zone on Mount Washington. The Cog Railway owners opened up the discussion with their history on Mt Washington, citing that a previous hotel sat on the summit, to lean on the fact that a precedent of there being a hotel above treeline had previously been set. They also framed the project as being a solution to the issue that they pinned on the state as a shortcoming, stating that they are unable to provide “proper services” to address “overcrowding” at the summit. Funny, at the planning board meeting the owner of the cog was comparing his 35 room hotel proposal to the alps hut system and how similar it would be to there. Interesting to read how different you think this proposal is from the alps. The White Mountains is 1,225 sq mi and the Alps are 80,000 square miles (the state of Minnesota is 79,617 sq/miles), something to think about when you’re considering development here vs there. It was also stated that the Cog Railway currently subsidizes state operations at the summit to the tune of approximately $200,000 annually. While this project claims that it will be completely privately funded, they did ask for latitude on zoning. 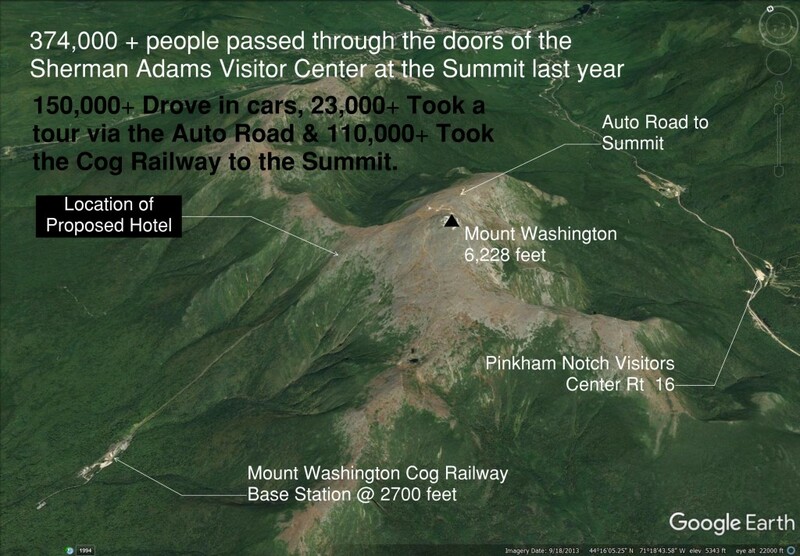 No one could answer the question as to what the “maximum capacity” of the summit could sustain-ably accommodate, nor what the projected impacts would be with increasing the traffic, except that New Hampshire continues to promote the mountain without apparent concern of consequence. We noticed that Fred King, the vice chair, presented with an air of confidence in this project. It’s difficult to say how the others level of concern may or may not be, but it is apparent that the Cog Railway folks are doing a “temperature check” and may be responsive to push-back if concerned parties start applying pressure to them publicly, citing the negative impacts. They State: With the number of people visiting the summit, there needs to be additional accommodations. Wayne Presby, president and co-owner of the Cog Railway said in an interview that Mount Washington has become a victim of its own popularity. With 300,000 coming there every year and as many as 5,000 on the mountain on a given day, they said there aren’t enough amenities to serve the public. He stated it would ease congestion. We Respond: The people already visiting Mount Washington, whether by the auto road, cog railway or hiking to the top, are there for just the day and most only stay for an hour or two. They aren’t looking for a hotel room or a fancy restaurant. The hotel will simply increase traffic in the alpine zone with its own guests and will not relieve the stresses of the current situation on the summit. The current configuration of the summit should be the limiting factor on the traffic it receives. Do not encourage more. With over 374,000 coming every year to this, the highest point in the Northeast and as many as 5,000 on the mountain on a given day, do we just keep building to accommodate everyone that wants to come with no regard for the mountain, or the people that love this mountain? We Respond: Are 20 new seasonal jobs and temporary contractor work worth the cost of potential environmental degradation? Any additional dollars to the local economy will only be captured by the owners of this development as they provide their tourists with transportation, luxury lodging and meals. With the hotel near the summit of the mountain, the surrounding towns at the base of the mountains will not see these hotel guests, and not profit from their visit. The Cog Railway owns a 90′ wide strip of land under the current railroad with National Forest land on each side. The required setbacks are 25′ on each side. That leaves 40′ to build on. Current zoning prohibits building above 2700′. The proposed building is at 5000′. Zoning laws were meant to protect against projects like this and should not be compromised. I don’t like the situation now and I just don’t see a scenario where this new development improves it. I ski and climb a lot in the Alps and I love the hut system there. Huts are small, and friendly and don’t interfere with your adventure, they are never on the summit. But you can swing in on the way down or up for a cup of soup and staying at one is very affordable. Unclear why things must be so very different here at home. Fire & Safety Issues – It’s remoteness causes real concern for fire and safety in this sensitive area. How would a major fire be dealt with? And putting more potentially uneducated hikers easily on top of a mountain with some of the worst weather in the world would add extra burden to the local search and rescue members. The narrowness of the building site – How grand can a hotel be when you are restricted to these building dimensions. What happens if this business venture fails? Are we left with a forever deteriorating blemish on the mountain? Development for Profit – The driving force in most developers is profit! And the rest of us suffer while they profit. An online petition created Dec. 2 in opposition to the hotel had attracted 6,307 signatures by Saturday — more than 11 times the 562 names attached to a counter-petition in support of the plan. Gareth Slattery, a local man who gave the hotel his online backing. This proposal would change all that, and would flood the high peaks nearby with ill-prepared, and worse than that, ill-educated “hikers”. I predict that the sections above treeline but below the area of broken rock, will be severely damaged within a few years. “The mountain has been so developed, and it continues to be exploited for obvious reasons — financial gain. It’s a hard pill to swallow,” said Dave Dillon, a 32-year-old hiker from Tewksbury, Mass. There is no doubt the North Country has benefited by the presence of the Cog Railroad, as it should continue to do so. We don’t want to take anything away. 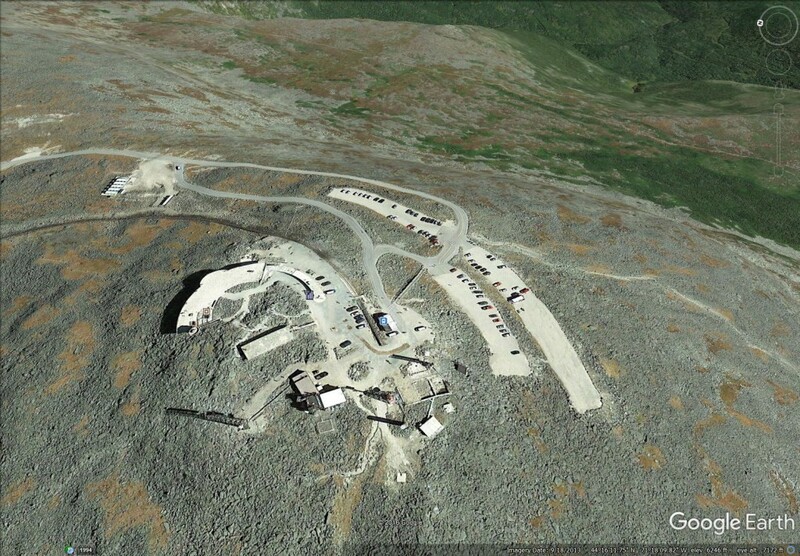 We’d even be open to the idea of the same hotel built at the base station as a compromise. But what we don’t want is more development on the mountain. Presby said in an interview last week that Mount Washington has become a victim of its own popularity. With 300,000+ coming there every year and as many as 5,000 on the mountain on a given day, they said there aren’t enough amenities to serve the public. “Tourism is the lifeblood of Northern New Hampshire,” the pro-petition states. But Presby notes the conditions are Spartan at the current huts and bringing a luxury hotel to the mountain merely returns Mount Washington to its history of having an elegant dining and residential space. David Dillon, a veteran hiker who wrote a blog in opposition to this plan, said he fears that bringing a full-service hotel back to this site will only encourage more growth. Share these petitions, share this article, share the news stories and Get The Word Out.